We need a pedestrian light at this corner/intersection so people can cross safely across Red Pump Road. Please help to get this resolved!! This request has already been submitted to the State Highway Administration. This is in response regarding your concern with pedestrian operations at the intersection of MD 24 (Rocks Road) and Red Pump / Bynum Road in Harford County. We appreciate the opportunity to respond to your concern. We are currently working on a design to installed APS (Accessible Pedestrian Signals) and CPS (Countdown Pedestrian Signals) pedestrian signals on Red Pump Road.nd add street lighting to the intersections. At this time, we do not have a schedule on when this improvement will be installed. We have seen and had too many near misses crossing with vehicles in both lanes trying to go straight across. Thank you for submitting this report. It has been forwarded to the Department of Public Works Engineering Division for investigation. Street light is out on Barrymore Drive at Red Pump Rd. Thank you for submitting this report. It has been forwarded to the State Highway Administration (SHA) for investigation. Thank you for submitting this report. It has been forwarded to the Department of Public Works for investigation. Stop sign is about to fall over. Just to clarify, the Sign is on Flintlock...what is the cross street? There are two (2) street lights out at this intersection. The first one is on the corner of Forest Valley Drive and Rock Spring Road. The second one is on the corner of Bynum Ridge Road and Rock Spring Road. Thank you for submitting this report. It has been forwarded to the appropriate staff for investigation. This issue has been forwarded to the State Highway Administration for investigation and repair. 6 individual potholes very close together covering entire width of one side of the roadway in front of 609 Bernadette Drive. 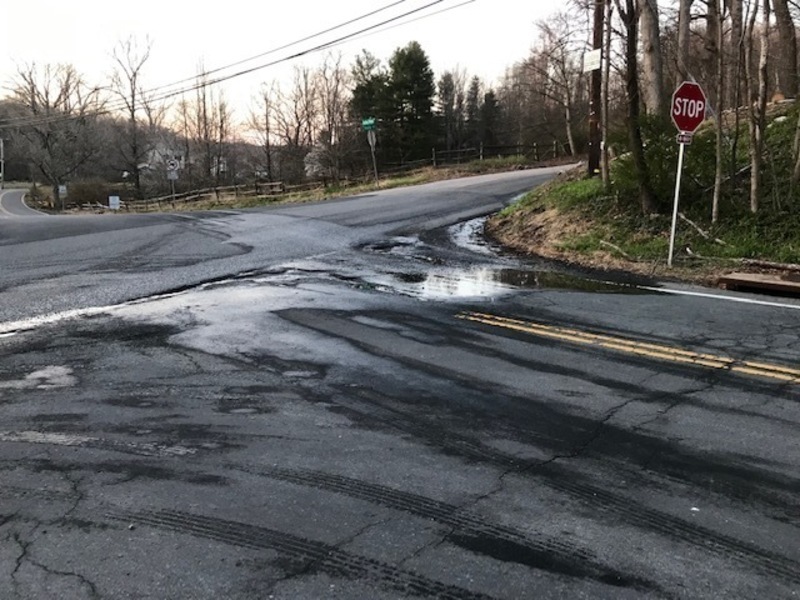 Additionally between 705 Bernadette Drive through just beyond 709 Bernadette Drive there is a pothole-like stretch of missing asphalt where the double yellow lines on the roadway should be, and then yet another pothole just beyond that as well. I use the intersection of Henderson and Conowingo Road numerous times during the day. There are often a long line of cars waiting to turn or go straight. I actually turn right and go around due to safety concerns. Just yesterday 12/9/18, I saw the remains of two cars that were involved in an accident there. Are there any plans to install a traffic light here? Have there been any recent traffic studies done? Thank you for submitting this report. Since this is a State road, the report has been forwarded to the State Highway Administration for investigation. Our system is monitored during normal business hours. Service Request number SR-0370706 has been created to track your concern and you will receive a response from us within the next few days. Thank you for contacting our Division of Citizens Affairs using our “You Click We Fix” application. We hope that our staff has been able to assist you in a positive manner. Constituent service and responsiveness to your needs are most important to this Administration, below is a link for Customer Service Survey and we encourage all of our citizens to participate. If we may ever be of further assistance to you on this or any other matter, please do not hesitate to contact us. This intersection is getting worse by the day. Photos are from Saturday, April 6th. There is not a proper crosswalk between Red Pump Rd and Rock Spring Rd between the McDonalds and She’ll gas station. This is an extremely busy road without the safety of a crosswalk. There is no pedestrian light and the crosswalk needs to be more noticeable. This is dangerous for people walking and cars driving. Thank you for submitting this report. It has been forwarded to the State Highway Administration (SHA) for investigation and repair. We are currently working on a design to installed APS (Accessible Pedestrian Signals) and CPS (Countdown Pedestrian Signals) pedestrian signals on Red Pump Road and add street lighting to the intersections. At this time, we do not have a schedule on when this improvement will be installed.